As the seasons change, it’s increasingly hard to hit the right balance between heating and cooling your home. Crisp fall air might feel like the perfect temperature, but if you leave the windows open overnight, you might wake up to a frost. So what’s the best solution for fresh air in the fall? Consider installing a ductless heating and cooling system in your home or office. Montgomery Heating and Aire in Mountain Home, Arkansas can easily handle this quick installation of a system that will not only give you greater temperature control and customization options but also save you money. 5 Reasons to Have a Ductless Heating and Cooling System Installed. Unlike installation of a conventional central heating and cooling system, setting up a ductless heating and cooling system is relatively non-invasive. Rather than ripping apart walls in a process that could take weeks, installation technicians only need to affix small wall units in the various rooms, as well as one unit outside, and connect them all to electricity. Three-inch holes are made in the walls for pipes, but the damage and disruption are greatly minimized. Once installed, ductless heating and cooling allows for more efficient energy use. The system itself uses less power than central heating and cooling, and there is no loss of energy through the transfer of air, since devices are installed within rooms themselves. You also have the option to heat or cool rooms individually, so no air is wasted, unlike central heating and cooling. Because of the multi-split system that allows owners to zone their homes for heating and cooling, a ductless system is more energy efficient. These systems are also certified by ENERGY STAR guidelines. Ductless systems are more effective than traditional systems because you can adjust the temperature in each zone, so you can raise the temperature to heat a room with windows but set a lower temperature for an interior room, for example. 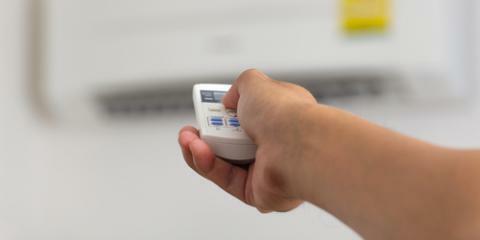 Increased efficiency and customization means a ductless heating and cooling system can save you money. And because of the lessened environmental impact, you may be eligible for rebates and/or tax incentives. So stop fiddling with the air conditioner and heater, trying to find a one-size-fits-all temperature. To install a ductless heating and cooling system today, contact Montgomery Heating and Aire online or call (870) 425-3001.